It has become a tradition. 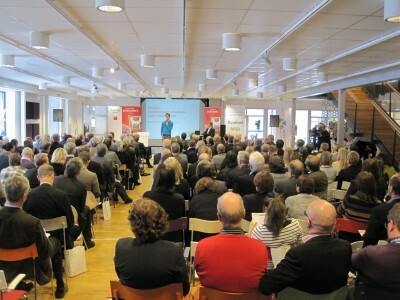 Every year at this point people from Swedish furniture industry meet up in the heart of Småland, in Lammhult for the annual Möbelriksdag – the Furniture Parliament. This year about 300 participants did show up deep into the dark Småland forest in the big entrance hall of Lammhults/Abstracta on January 4th, well done! 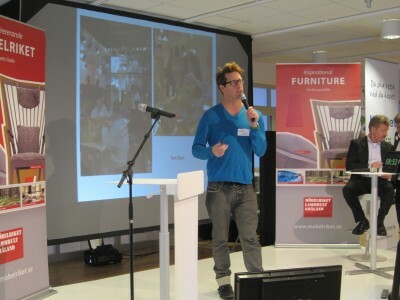 Möbelrikstagen is arranged by Möbelriket – the Kingdom of Furniture – a trading region and a network of design and furniture companies from Småland. Möbelriket working together to highlight the unique design and furniture history from the region. To name just a few examples: Lammhults, Abstracta, Norrgavel, Bruno Mathsson, Källemo and Ikea. Möbelriksdagen is a kick-start. Kind of a team building event and gathering of our strengths together to meet the new year. A lot of interesting subjects, as design export, destination building and good examples in how to build long term sustainable companies and products. The program was tight! About 60 speakers entered the stage. Among those Jens Spendrup representing Företagarna, Stefan Nilsson from Trendgruppen, Patric Åström – Stockholmsmässan, Lars Bülow – Materia, Johan Lindau – Blå Station, Tomas Carlzon – MD Ikea. The day was both inspiring and informational and I met a lot of new and old friends and had a good time all in all! Thank you Möbelriket – Johan Sjöberg and Anders Wisth! Design Sydost is a business network, aiming to unite the design competence in south east of Sweden. It is an interaction between different design disciplines, companies, education and organizations dealing with growth and development issues in the region. Design Sydost provides information about design services; answering questions on what it is, how to do and where to find it. I have been taking a big part coordinating Design Sydost from the beginning after an open invitation to the design competence in the region last year. The project is supported by The Regional Council in Kalmar County and the European Union, and connected to Swedish Industrial Design Foundation, The Swedish Society of Crafts and Design and The Swedish Association of Designers. More information about Design Sydost can be found on www.designsydost.se. 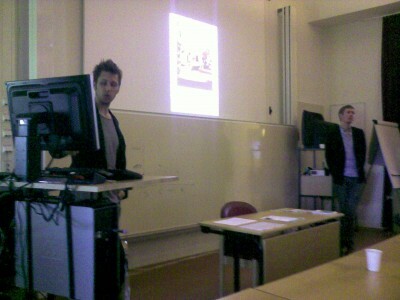 As a part of the activities within Design Sydost, a large meeting recently was taking place in Eksjö. 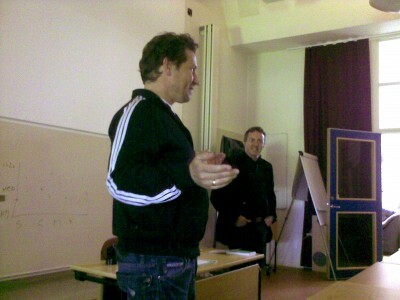 On the 15th of May me, and the design strategist Erik Mohlin, organized, Design Småland 09. 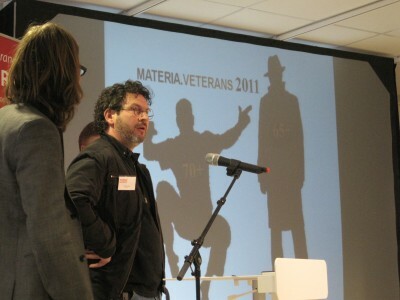 The program included very interesting speakers. Jesper Ståhl, founder and owner of Jesper Design in Jönköping, introduced us in their working process and very exciting cases. Marcus Arvonen, from IKEA Design Department, told us the story about his beautiful lamp ”Maskros” and the work behind it. Jonas Pettersson and John Löfgren från Form us with Love showed us their work and also Stina Sandwall from Sandwall Design. The final act was from Håkan Waxegård, the founder of Hultsfredsfestivalen, revealing new music festival projects involving design. After the meeting the group visited Eksjö Museum and the contemporary design exhibition coordinated by Erik Mohlin. Very nice! Ok, it´s only the second time – I know, but anyway, I would like to think of it as a tradition. What? The annual Design Sydost Meeting for design in southeast of Sweden of course! Last year we gathered in the beautiful summer town Västervik (my home town). This year Design Sydost invites everyone to Eksjö in the heart of Småland, to the city of wood. The program includes interesting speakers with diversified backgrounds. The theme will be Innovation, Identity and Design. First out is Jesper Ståhl, industrial designer and manager for Jesper Design in Jönköping, to be followed up by Marcus Arvonen, from IKEA Design Department, the designer trio Form Us With Love and finally Stina Sandwall furniture designer. Furthermore it will be information from the designer business network Design Sydost, telling about the development and the future plans. Fiesta Eksjö will explain what happens when ”Music Sweden meets Design Småland”. The day will end up with a visit to the furniture design exhibition Design Småland 09, showing some master pieces from the province of Småland (not only Ikea). So, what are you waiting for? Enter today! 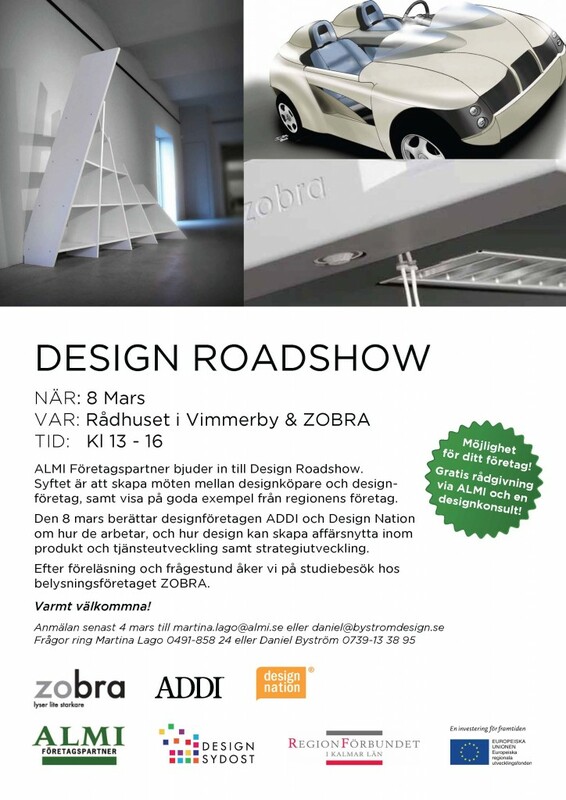 Don’t miss this opportunity to mingle with design collegues and design connected competence from southeast of Sweden. Meet old friends and get to know new ones! For you who wants to stay in town, Fiesta Eksjö has organized rock at the stadshotellet from 20.00 – performance by no one less but the Perssons Pack! Of course the arrangement is free. Find the invitation, program and map below. Info: Arrangement is free of charge.